For those of you who missed the webinar, The Strengths of a Small Church, with Brandon O’Brien and me, the video is online now. Tim Avery at BuildingChurchLeaders.com put it up yesterday at their site. The seminar was well-attended with lots of participation in the comments and chat portions of the webinar screen. The webinar ran about an hour, so grab some coffee, get comfy and tune in when it’s convenient. Kids love VBS and it shows! Kids love VBS and this 45-second video clip proves it! Part of the VBS fun is learning the songs and motions, and getting into the spirit of the theme. You don’t need a lot of high tech stuff, but you do need some enthusiastic leaders, which we’ve got this week. The audio isn’t great, but you’ll get the idea that kids are having fun at Saddle Ridge Ranch this week. We partner with 4 other churches in our community to do VBS each year. Each church takes a turn leading VBS planning, and hosting the community for VBS week. This year we’re at Chestnut Level Baptist Church for Saddle Ridge Ranch VBS. The other churches participating include our church, Chatham Baptist; Watson Memorial United Methodist Church; Oakland United Methodist Church; and, Chatham Presbyterian Church. Here’s a quick video montage of the sets, rooms, and our first night at Saddle Ridge Ranch. This was the scene at our church for Favorite Hymn Sunday. We’re meeting in our fellowship hall because there is some sort of electrical problem in our sanctuary. But, we served lemonade and cookies between Sunday School and worship, so everybody was happy. Or maybe they were happy because I didn’t preach this morning. Who knows, but take a look at our small church in action on this hot Sunday morning. 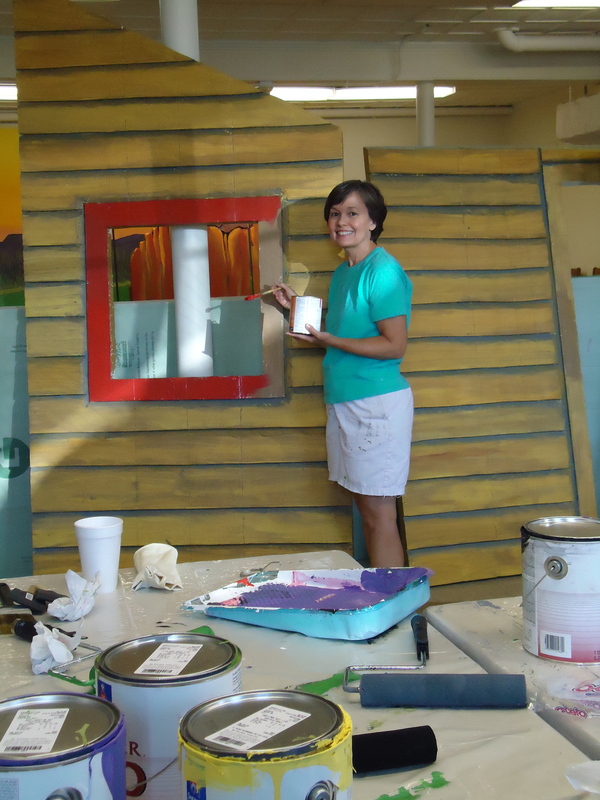 Debbie is painting the backdrop and set for our community VBS. This year the theme is “Saddle Ridge Ranch,” which is available at LifeWay stores. We partner with 4 other community churches — a Presbyterian church, two United Methodist churches, and another Baptist church — for VBS each year. All of our churches have about the same attendance, which is under 100 on average, so partnering with other churches helps share the cost, provides lots of adult helpers, and lots of kids for VBS. 5:00 PM: Our bus leaves our parking lot to make the trip to this year’s location at Chestnut Level Baptist Church. 5:30 PM: A snack supper is provided for $1 per child, and $2 per adult to help working families get there together. 6:00 PM: VBS starts each evening. 8:20 PM: Bus arrives back at our parking lot in Chatham. We start on Sunday evening to give us time to set up that afternoon. We don’t serve the snack supper on Sunday, but Monday through Thursday nights we feed 80-100 people supper. Each church pays a pro-rated share of the expense of VBS based on the number of children (not adults or workers) each church has enrolled for the week. Usually the host church for that year spends a little more than the other churches, but over 5 years it all balances out. What is your church doing for VBS this year? 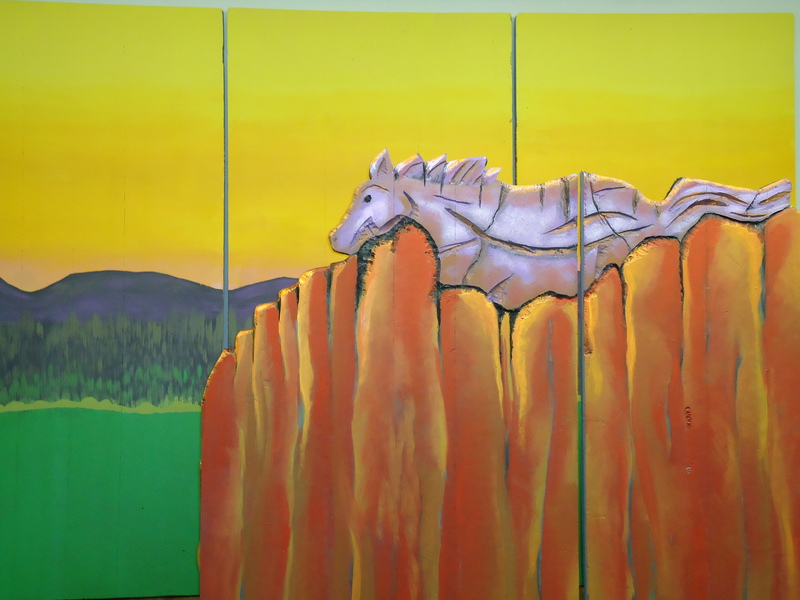 Our community VBS backdrop for Saddle Ridge Ranch. A bunkhouse and ranch entrance will add to the western theme this year. 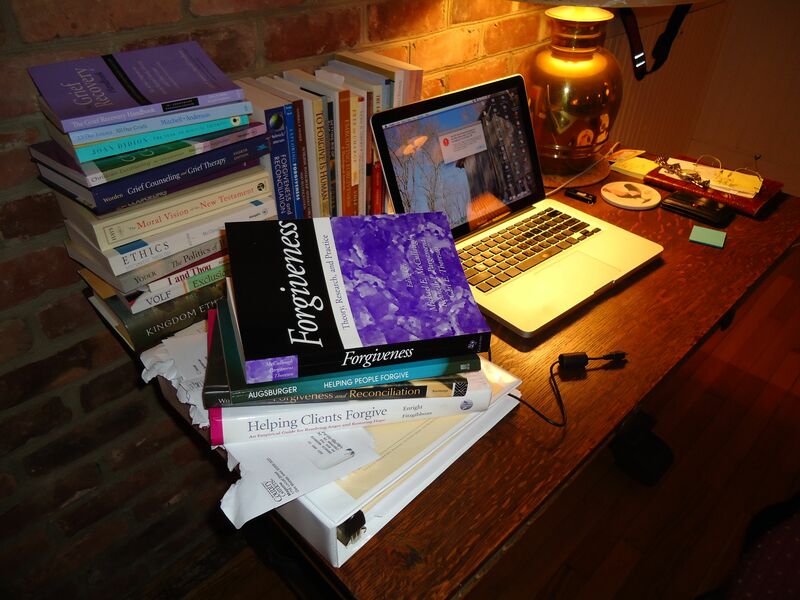 Debbie commented today, after looking at all the books on my desk, “Do you know you have 31 books on forgiveness?” Actually, I didn’t but she’s pretty close. I’m working on a writing project about forgiveness. In the process, I am trying to craft a new definition for forgiveness, which is harder than you might think. Can be practically applied in local church ministry to assist and encourage the forgiving process. What definition of forgiveness meets all of these criteria, and is clear enough to be helpful to pastors in their local church ministry? Any thoughts? Fire away in the comments. Thanks.